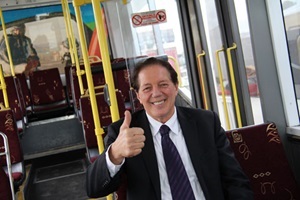 Mayor Tim Shadbolt was first on board for the launch of the Bus Smart service in 2012. The Bus Smart service was launched on December 3, 2012. There are four looped routes beginning and ending at Bus Smart Central (outside Reading Cinemas in Dee Street). The rebranded buses offer features ranging from free Wi-Fi to 10 per cent fare discounts for people who use the Bus Smart Cards. The services that replaced the 10-route system which included the Purple Circle buses and the Freebie bus, are: Waikiwi Link, Windsor Comet, Heidelberg Star and Kew Connection (see the links at left). The city’s bus service is funded equally by Invercargill City Council ratepayers and the New Zealand Transport Association. Bus Smart is the result of collaboration between the Council and Invercargill Passenger Transport involving rebranding, new bus routes, timetables, signage, bus stops and shelters. Free Wi-Fi aboard the buses. A text service that allows people to text a bus stop number and receive the next two estimated bus arrival times. Bus Smart Cards: these allow people to load credit on to their cards to pay bus fares – and to receive a 10% discount. There is a one-off $5 fee for the card. Cards can be “topped up” at the Council Aministration Building (cash or Eftpos – no credit cards) or by bus drivers (cash only). Holders of Super Gold Cards will travel free during off-peak hours (they will also need to hold a Bus Smart Card, but when they use it during off-peak times, no fare will be deducted from their card). Audible bus stop information and large flat-screen displays screens on the buses. The screens will also display news, weather and information about the Bus Smart service. Low-access floors make it easy to step on and off a bus – and means the buses are wheelchair accessible. Bike racks. All Bus Smart buses are fitted with an outside rack capable of holding two bicycles.